I've pretty much been there since the beginning (with my juddery HTC Hero) and now I have a GS2.. The problem with W7 and M$ is that we're not even talking about processors (although that's one point) - I don't think they've even got dual-core yet... and trust me - the difference between the GS1 and GS2 is unbelievable re: performance..
Nokia is good at this game. Look at their 2010 phone range. Cheaper C6-01 raised with almost same specs as N8 flagship(minus the camera and HDMI port) wich was almost the same in specs as keyboard E7 almost identical too with X7-00 one. 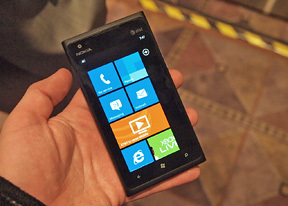 Anywhay, still wondering what Lumia 800 owners have to say after they bought it thinking this is it and after a month Nokia released another one pumped up(whith the specs everyone yelled about: front facing camera and larger screen). I believe the will be variants of the 900 for Europ and Asia. The US are so lucky to have the 900 first. This beauty with Nokia's other accessories (Like the Luna and Purity) will be a really cool combo. MS is imo doing a good job forcing manufacturers to a common hardware spec and I'll tell you why I believe it so. With Android, the CPU core race has started, Tegra 3 is quad core and while it has lower power consumption, battery life is already pathetic on most phones. Why would you need a quad core CPU on your PHONE? The other thing is that you'll get less optimised code with an OS and apps that are more and more power hungry. While at the same time these power hungry apps or OS might not even work on your two year old phones. Thus rendering them from a technological viewpoint obsolete. On the other hand with WP7 being optimised to run fluently on "limited" resources, the experience remains consistent for every user on whichever device they choose to go with. This also forces developers to optimise their code thus giving you a better experience and also gaining them experience. I'm not saying WP7 is perfect because it's not (the thing doesn't even got mass storage mode), but you gotta ask yourself is a quad core CPU really necessary? Especially for an OS that doesn't need it. Biggest problem with all the WP7 phones is storage, 16GB nowdays is way too small. Every AMOLED screen until now is PenTile except Samsung's SAMOLED Plus, therefore if it's not specifically mentioned and marketized as RGB matrix then it is almost certainly PenTile. Oh, and you can see it in every ambient, especially with 800x480 resolution.